Readers who enjoy personal experiences from the author or who love the classic “boy and his dog” style will find this book a treasure among treasures. Other books by Mowat are, The Boat Who Wouldn’t Float, Owls in the Family, and Never Cry Wolf. 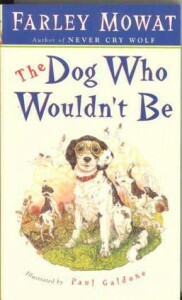 Readers who enjoyed this book may also enjoy reading Marley and Me, Because of Winn-Dixie, and other dog related stories.